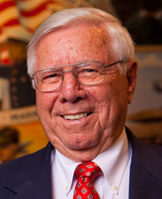 On November 2, 2010, at age 81, Mr. Charles “C.J.” Christ secured funding for the Regional Military Museum in Houma, ensuring its stature as a world-class archive and educational resource on American military history. Through aggressive lobbying and tireless commitment, C.J. won public support for the Terrebonne Parish Veterans Memorial District, earning a $1.7 million bond issue to support the museum’s growth and better showcase its treasures. With funding secured, the museum is slated to expand at its current space to a significantly larger home where its artifacts can be more appropriately displayed. Construction will soon begin on a facility that will feature dramatic displays and allow demonstrations of military vehicles, weapons, uniforms and other relics of American military history. Unlike most military museums tied to a specific war or service, the Regional Military Museum tells the full range of American military history, from the founding of our country to today’s events. Thanks to generous donations of military memorabilia from institutions and individuals worldwide, the museum has amassed an impressive collection that awes the first-time visitor and serves as a center of pride for area residents. The museum is also a center of pride for C.J. Christ, whose military background and extensive research sparked the dream that launched the museum. A tireless researcher and acknowledged authority on German U-boats, C.J. has published hundreds of articles, regularly lectures on military issues and wrote the definitive book, World War II in the Gulf of Mexico. His command of military subjects has fostered international recognition and relationships that helped him establish the museum and grow its trove of historical treasures. Through life experience, C.J. Christ has earned the credibility to create this museum. And just as important, he has perfected the personal skills to enlist a growing team of supporters to take the museum to new heights. C.J. Christ… Peoples Health Champion.